More recently, I have been watching a Korean drama recommended by Editor-in-Chief Jonathan Kwan, called Descendants of the Sun. When he first told me to watch it, I laughed him off, especially as I do not normally watch these shows. In addition, I did not have a legitimate source to watch from, unlike what Jonathan mentioned in his Seagate IronWolf ST10000VN0004 10TB review. Since then, it was uploaded onto Netflix, granting me full access to the series. It has been a slow process watching it, especially as I do not have the most time in the world, and I am still not finished yet. I might not be a very good critic of shows, especially foreign dramas, but so far I have quite enjoyed it. According to another friend, who is well-versed on the Korean entertainment, she said I liked it because no matter the circumstances, I could trust a positive solution would be found in the end. In my opinion, this statement is quite true, as I never really liked shows with a dark or sad end. The fact the main actress, Song Hye-Kyo, is very pretty in my opinion also helps quite a bit, but I digress. To me, the shows I watch and like should always make me smile in the end. There may be a few confusing, disappointing, or saddening parts in the story, but it would always have a satisfying finish. Why anyone would do otherwise is confusing to me, but I guess it comes down to preference too. Thus, when LG sent us their G Pad III 8.0, a mid-range tablet with decent specifications, I had to wonder what it was really like. Will it be a happy end with this Android tablet, or will there be drama to speak of? Read on to find out! 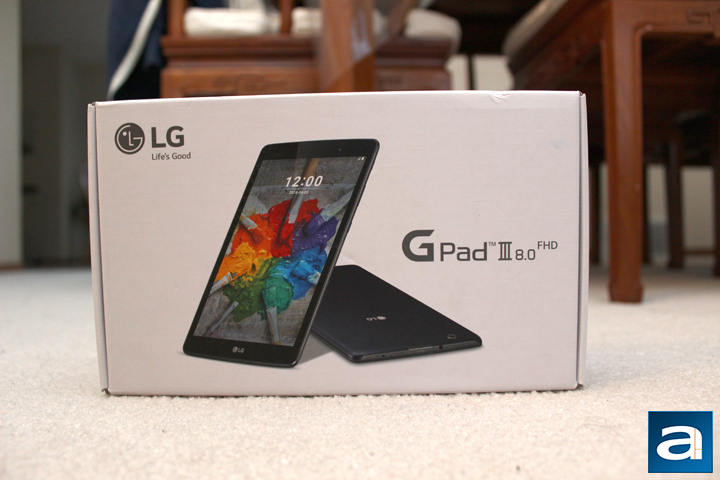 Today's review unit of the LG G Pad III 8.0 arrived from our public relations contact in Toronto, Ontario. 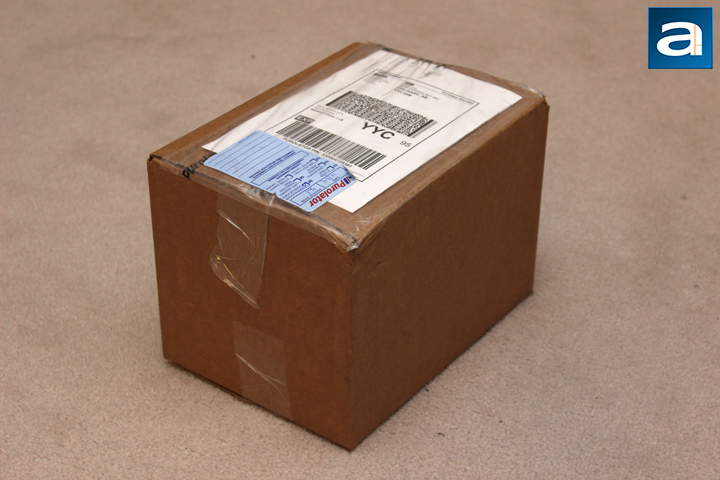 Traveling with the Canadian company, Purolator on their Express service, this parcel arrived to us in good condition. The corrugated cardboard box had no dents or scratches to be concerned about. In addition to the tablet, we also received LG's G5, which we will be taking a look at later on this month. Oddly enough, there is actually no packing material to cushion when the box moves around, as there is quite a bit of empty space in the box. Even still, the products came to us in good condition. Out of the shipping container, I pulled out the G Pad III's retail container to display in all its glory. This is a pretty standard look with consumer electronics like Android tablets, as their boxes are generally quite plain. As a lot of the specifications are just a bunch of numbers; the bigger selling point is the user experience, so manufacturers do not necessarily need to state all of its specifications right on the box. 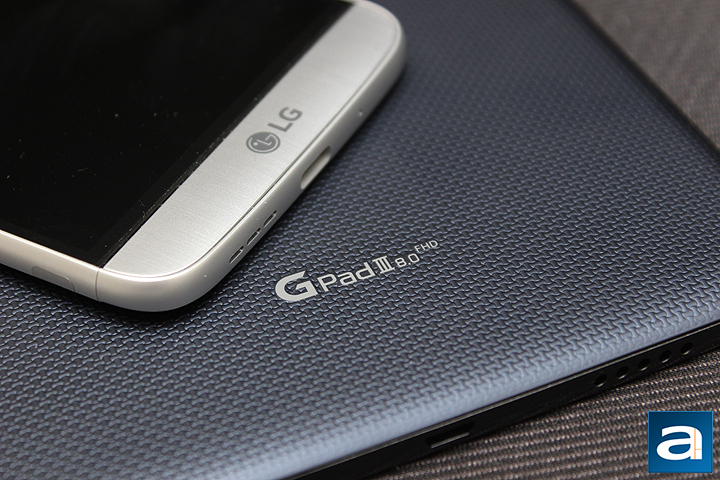 At the front, we have the LG G Pad III 8.0 shown off, revealing both its front and its back. The manufacturer's name is printed on the top left, while the model name is on the right side. The back of the box highlights some key features of this Android tablet, although no specific figures are really mentioned on the box. Otherwise, the white container is pretty clean in nature. Out of the box, there are four things to speak about. One is the LG G Pad III 8.0 itself, wrapped in a plastic bag to prevent any scratches on the tablet. Next is the white USB AC adapter, which charges at a standard 5V, 2A specification. In addition is a micro USB to USB cable, measuring approximately 1.2m in length. Finally, we have a small user manual, although this piece of documentation does not hold much information, so you can pass on this. Let us take a closer look at the tablet itself. If you remember our report on the LG X power, you will realize there are some similarities between the LG G Pad III 8.0 and the phone, at least in terms of appearances. Taking a look at the front, there is a huge eight inch touch screen. The top shows a 5MP front facing camera. Unfortunately, there is no ambient light sensor, meaning you cannot rely on any sort of automatic brightness. Finally, an LG logo is located near the bottom in a silver metallic finish. Build quality is overall passable, with everything feeling solid as is. There is a bit of creaking and flexing at the back, but this is not too surprising for a plastic build. All of the buttons can be found on the right side of the G Pad III 8.0, with a power button, volume rocker, and a third button. In my time using it, I kind of got used to this placement, but there were a few annoyances. For one, I found the power button to be too far up, making me stretch my hand. I know I might have smaller hands in relation to the general public, but it still was a bother for me. Of course, the screen can also be awakened by double tapping the screen, so this is not a huge issue. The volume rocker I found was a bit too small, although it is notched on the one of the sides to make differentiating the buttons easier. The third button is a shortcut key to launch applications. By default, it turns the tablet into reader mode, but I will talk about this later. Overall, the buttons offer decent feedback, and are raised out of the body enough to be identifiable. At the top of the tablet, we have two ports to speak of. One is a 3.5mm audio jack, which thankfully is still here to stay. The other is a full-sized USB 2.0 port, covered by a plastic flap. I will get more into the behavior of this later on. At the bottom of the tablet, we have a micro USB 2.0 port in between two sets of speaker grilles. However, on closer inspection only one of the grilles has actual drivers outputting music, while the other is there for symmetrical design. Flipping the LG G Pad III 8.0 over, we can see several things. The back features a sort of crosshatch-like design, similar to the LG X power. LG's branding can be found in the middle of the tablet, with the product's name at the bottom edge. A sticker containing the IMEI and serial number can also be found here. The rear-mounted 5MP camera is located on the top left corner. To keep it clear though, I would never suggest you to even consider using this tablet as a camera, unless you want to become one of those people. I am not judging at all, but in all seriousness, tablet cameras in general are not close in quality to most smartphone cameras, and it looks ridiculous to hold such a large device to take a picture. Finally, under all of the buttons is one more flap, and inside are two things to take note of. One is a pop out SIM tray to hold a Nano SIM. Next to this is a micro SD slot, with the ability to hold a theoretical extra 2 TB in expansion. Powering everything is an eight-core Qualcomm Snapdragon 617, paired with 2GB of memory. This mid-range processor should get most tasks done, but it is slower than some of Qualcomm's 800-series CPUs. In addition, inside is 16GB of storage, though approximately only 9GB of it is usable space. This is somewhat unfortunate, but it can be forgiven as a result of the expandable storage with micro SD cards. As you may have noticed from the specification sheet, not only is this Wi-Fi capable, up to Wireless-AC, but it also supports LTE with its Nano SIM slot. This device in particular is locked to the Rogers network in Canada. Other connectivity includes Bluetooth 4.2 and GPS. Powering on the LG G Pad III 8.0, Android Marshmallow 6.0.1 can be found running on this device. After making a few changes, including running the latest security updates and changing the home screen to a more usable one with an app drawer, this is the homepage I am now greeted with. Like many Android device manufacturers, LG has overlaid the standard Android interface with their own user interface. 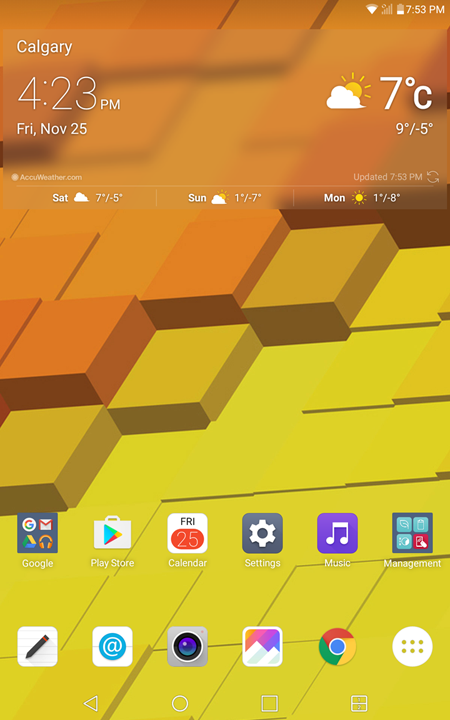 On the LG G Pad III 8.0, we have a skin called LG UX 5.0. It is relatively lightweight, as the biggest changes are seen in the Settings menu and the drop down menus. A more detailed look at the differences between LG's interface and the vanilla Android can be found elsewhere, but I will say after using several LG products, it has definitely become less bloated in feel. I used to only swear by stock Android, but I quite like the several enhancements LG has placed in. On the other hand, one thing I do take offense in is the amount of additional apps on this tablet at launch. Quite a few of them are also non-removable. Thankfully, they are useful applications, such as Microsoft's Office suite. Duplicate coverage from apps is also quite minimal. It is a bit biased to say as I have used quite a few LG products now, but they are generally quite easy to pick up and use. Gone are the days where Android has a steep learning curve, and a lot of the enhancements made by LG has made this easier. For example, LG has allowed users to customize the on-screen buttons in both position, and adding extra functionality such as a shortcut to drop down the notification menu. Small things like this have shown not only LG's commitment to Android, but also the overall maturing of Android as an operating system. If there is one thing differentiating a smartphone and a tablet, it is most definitely the screen real estate. While some phones have encroached on mega territory, hitting up to and beyond seven inches in size, the majority of the phones are still in the 5.5" or smaller category. 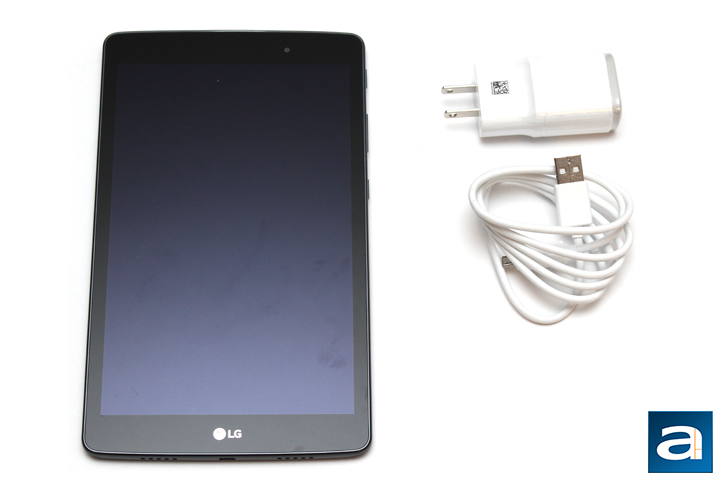 On the LG G Pad II 8.0, you can tell by the name this is an eight inch tablet, with a resolution of 1920x1200. Hence, this is a 16:10 widescreen tablet. While it does offer more pixels on the screen, it does mean watching things like movies will result in black bars showing up above and below. With a pixel density of approximately 283 PPI, images and photos on this display are quite sharp. The IPS display exhibits pretty good viewing angles. I cannot really comment on color accuracy without actual tools, but to me things look natural, if not a tad warm. The screen gets quite bright, making it usable in direct sunlight, albeit with a glossy and reflective screen. Last of all, as mentioned previously, there is a third button located under the volume rocker, and by default this enables "Reader Mode". According to LG, this will make it easier on the eyes to read. In practice, this applies a sepia-like filter over everything, making the screen brown and white. This mode definitely does its job, making everything easier to read. Finally when it comes to battery life, I do not have a reliable or scientific test, but I will say it is quite good overall. 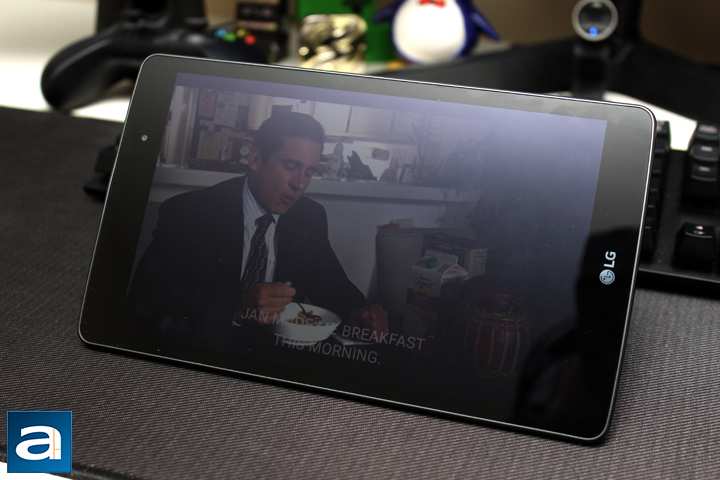 During my time with the LG G Pad III 8.0, my usage was quite mixed between video consumption from Netflix, YouTube, and Twitch, in addition to general note taking and writing this review. I was easily able to get more than 5 hours screen on time, with several days’ worth of standby time. With an internal battery of 4800mAh in capacity, these results are not a surprise. The time it takes to charge the LG G Pad III 8.0 from empty to full is around one and a half to two hours. This is pretty typical, as there is no sort of rapid charging implemented. You might think this is a misplaced photo of the AZIO MGK L80 RGB. However if you look closer, you will see the fact the keyboard is actually plugged directly into the tablet. The LG G Pad III 8.0 comes with a full-sized USB port, which allows you to plug your devices, whether a USB drive, external hard drive, or even peripherals like a keyboard or a mouse. 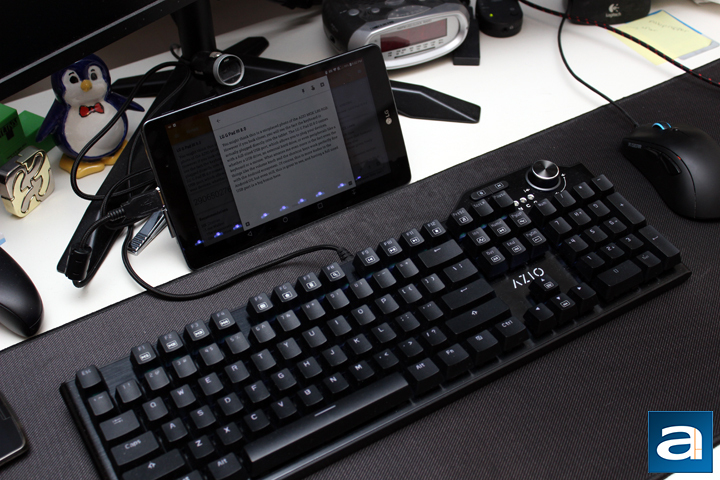 This probably is not the standard use case, as a keyboard as large as this is not exactly the most portable solution, and this was more intended for external USB storage. What amazes me though is the fact even the volume knob and the shortcut keys on the MGK L80 work perfectly fine with the Android ecosystem. Of course, this is more kudos to the Android OS, but even still, this is great to see, and having a full sized USB port is a big bonus here. In fact, this paragraph, plus the several above, was written on this tablet using the mechanical keyboard. This may not make the tablet a full fletched laptop, but it is still quite nice to see the capabilities. As we are already getting closer and closer to Christmas, you might be wondering what you want to buy for your friends, your family, or your significant other. A few years ago, a tablet would have been a great choice, as they were just coming onto the stage, and products like the Google Nexus 7 was all the hype. However now, a lot of tablets are just watered down, low specification products, great for kids and grandparents, but not for anyone else. 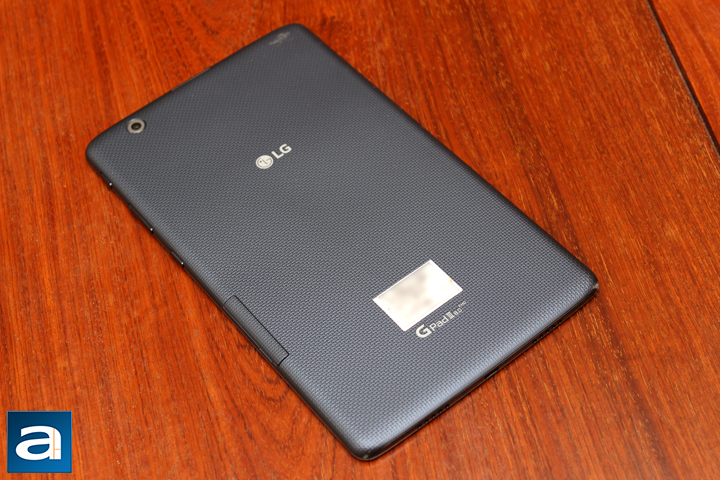 Thankfully, the LG G Pad III 8.0 does not fit this mold. This tablet is actually quite good in terms of usage, screen quality, and additional connectivity like LTE and a full USB port. While it may only have a midrange processor and average build quality, the G Pad III 8.0 gets the job done, and adds a few extras. In terms of availability and pricing, this tablet is actually only available in Canada for approximately $240 CAD. Compared to other products, there is a bit of a price premium for an eight inch tablet, but I think it is still quite competitive considering everything LG has brought to the table with the tablet. Thus to answer my question in the beginning, the LG G Pad III 8.0, while it has its minor quirks, is definitely a happy end in my books, and you can consider this tablet if you are looking for a solid media consumption device. 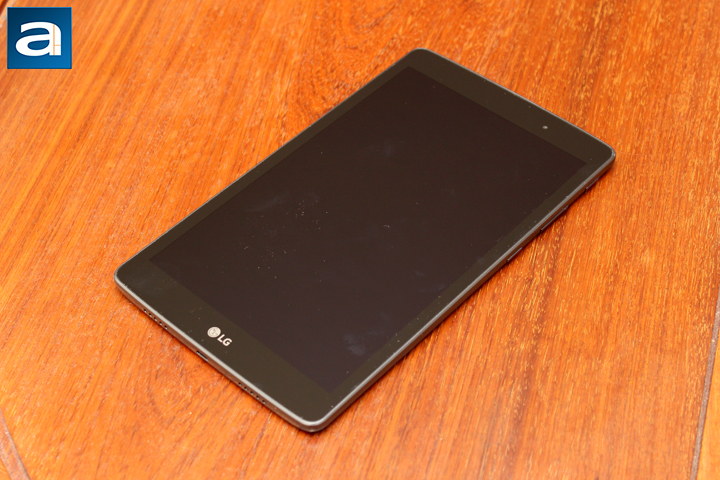 Do you have any comments or questions about the LG G Pad III 8.0? Drop by our Forums. Registration is free, and it only takes a minute!